Time Zone: Ireland is on Greenwich Mean Time, 5 hours ahead of Eastern Standard Time. Ireland is a place so lavishly endowed with myth and romance that you might think the reality could never match up – and yet, it never disappoints. 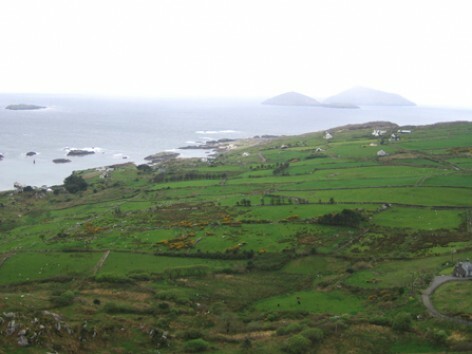 Its impossibly green, picturesque landscapes are both dreamlike and familiar, making even visitors without a drop of Irish blood feel like they’ve come home. Its rich mythology is everywhere, in carved stones, ancient monuments, and tumbledown castles. Walking along its misty lakes and through its primeval forests, magic suddenly seems possible. But Ireland is also very much of this world, with a history that would be fascinating and epic even without the many legends. Vikings and Normans, chieftains and earls, early Christians and druids, revolutionaries and literary heroes have all played their roles. The country’s turbulent past has seen famine, war, and rebellions, hard times and economic booms. Yet there’s nothing dour about the national character – the people are warm and friendly, with a wry, self-mocking sense of humor, and a deep love of music, poetry and literature. Even Ireland’s frequent rain showers are something to look forward to, as they offer an excuse to duck into the nearest cozy pub for a perfectly drawn pint and good conversation. The island is blessed with an enormous quantity of interesting sights, from ruined monasteries and castles to ancient tombs and dry-stone forts. The cities offer a trove of excellent museums, and cultural festivals are held throughout the country year-round. As for natural beauty, there is a rugged peak, glacial lake or spectacular cliff around every turn. Ireland’s relatively small size means you can cover a lot within a day – nonetheless, we suggest you don’t try to see too much in one visit. Part of enjoying Ireland is strolling its woods and beaches, exploring the cobbled streets of its villages, and lingering in its pubs and cafes. In these pages, we focus on the areas we know best – the coastal counties of Southern Ireland – but the center and north have their own glories, which we can’t wait to discover (and which our regional partner knows well).